The award-winning guide for beginning quilters, this book has everything you need to know! Opening with the basics on equipment, fabrics, and ¼ seams, you’ll then learn essential quilting and appliqueing techniques and how to assemble and finish a quilt. With 7 practice projects that include step-by-step instructions and full-color illustrations, discover the joys of quilting keepsakes! Helpful tips, charts, and formulas throughout will further your understanding and skillset along the way. Jeri Simon, has been in the quilting industry for over a decade, first with Fons & Porter, then for ten years with Landauer. 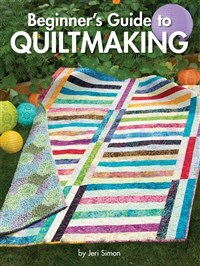 Her most recent book, Beginner's Guide to Quiltmaking was Foreword Magazine's Gold Book of the Year in crafts & hobbies.